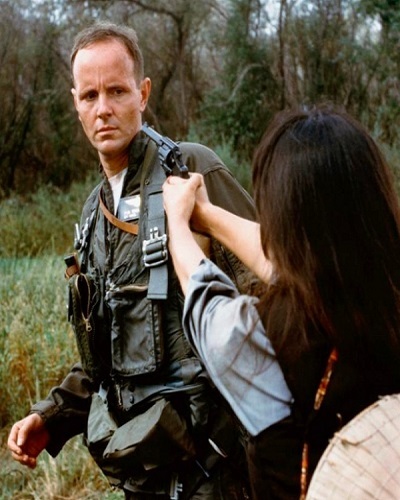 In 1987, Emmy and Golden Globe award-winning actor Michael Moriarty starred in the Vietnam War motion picture Hanoi Hilton in which he played an American POW much like Sen. John McCain. It all began with the Democrats and their formerly Confederate insistence upon slavery in The South. Then, amidst this American 3rd Millennium, that political party took ownership of half the United States by virtue of the Clintons’ increasing alliance with the Bush family and the Bush New World OrderRINO’s. I spent about six weeks pretending to be Lt. 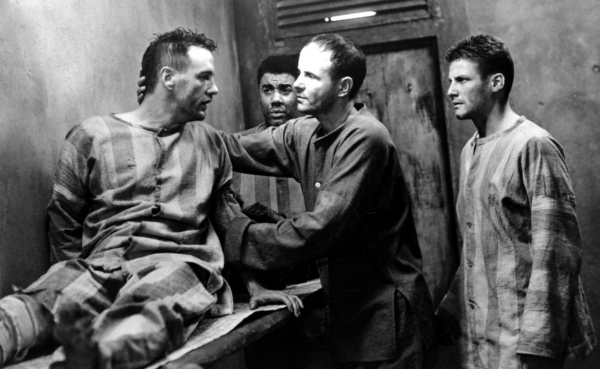 Colonel John McCain in the film, HANOI HILTON. Albeit, Donald Trump, when merely a candidate, did, indeed, dismiss McCain’s imprisonment in Vietnam as short on heroism. The film, Hanoi Hilton, paints a different picture. In Hanoi Hilton, all Americans imprisoned by North Vietnam and spat upon by Jane Fonda are American heroes. Upon release, Bryant Gumbel of the Today program, both obvious fans of Jane Fonda, felt obliged to alert me to the political realities of mainstream media. Apparently, because of my appearance in Hanoi Hilton, I was no longer “serious” about acting. According to Gumbel and NBC, neither John McCain nor the film, Hanoi Hilton, are to even be viewed, let alone taken seriously. That’s how the interview began and, well, it was all, as NBC and Bryant Gumbel wanted, downhill from there. What a wake-up call to the political hit squads of my old Law and Order network, NBC. In light of my introduction to John McCain and the Hanoi Hilton, it’s tastefully self-serving to hear the graduate of The Hanoi Hilton attack a President of the United States for “spurious nationalism”. From a former prisoner-of-war, the accusation may carry some weight. When did Donald Trump ever risk his life for America? President Trump is obviously risking his life every day now! The “entertainment business” is filled with black humor about a “dead Donald Trump”. 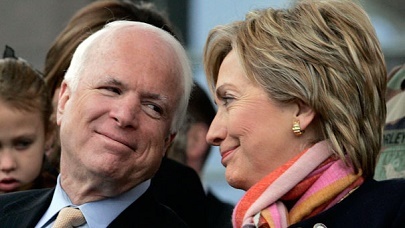 War hero Sen. McCain with his former colleague Hillary Clinton. While he suffered the horrors of the Hanoi Hilton, she and her future husband marched with groups carrying the Viet Cong flag. The possibly tragic irony is that both Lt. Col. John McCain and all the American servicemen and women in any war America ever engaged in are, despite the Trump/McCain contretemps, the President’s heroes. They’re receiving long-over-due and major, ongoing tributes from Donald Trump. We are, as I have already said, in America’s Second Civil War and we all know what happened to President Abraham Lincoln. John McCain, from my decades-long experience of his fame, now appears to be an increasingly intransigent New World Order RINO. He’s become “the bad cop” of the Good Cop/Bad Cop RINO Revolutionaries. George W. Bush’s third-party-denials about his recently “not-so-veiled” assault upon Donald Trump. Both McCain and the Bush Family are increasingly exposed servants of The United Nations. What does a world run by the United Nations mean? A complete victory for Red Islam. The ultimate triumph of a contradiction-in-terms: Muslim Communism… or Communist Muslims. In short, the death of the United States, its Declaration of Independence, its Constitution and its Bill of Rights. Scene from the motion picture Hollywood loves to hate. Despite the claims of Islam, The New World Order is godless. That, of course, is Christopher Hitchens’ highest recommendation for anything! However, America is not only on the verge of her second civil war, she is in the obvious first stages of an Armageddon now. Vietnam War Veterans are now receiving a mounting number of belated tributes. The world’s growing nightmare with the insanely Red and threatening likes of Kim Jong un of North Korea makes the Vietnam War look not only inevitable but utterly justified. Communism’s and Islam’s #1 enemies? President Donald Trump and American Nationalism. Michael Moriarty is a Golden Globe and Emmy Award-winning actor who starred in the landmark television series Law and Order from 1990 to 1994. His recent film and TV credits include The Yellow Wallpaper, 12 Hours to Live, Santa Baby and Deadly Skies. It’s LTCDR, not LTCOL. McCain was not a Marine Aviator or a USAF Pilot, but a Naval Aviator (Paragraph 4). Keep up the great acting!